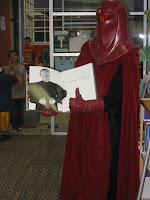 Thanks to all who made Star Wars Day @ Bowles Library a success, including the North Texas Squad of the 501st! To see what went on, check out the Bowles Library Flickr page! If you're looking for pictures of individual children, please contact Mz. Christie at the Bowles Library (972-237-7540) for more information.